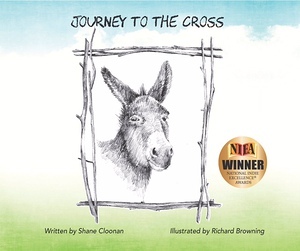 A fictional tale that takes readers on a journey from our Lord’s birth to his crucifixion told through the eyes of his unlikely friend, “the donkey”. Though written and illustrated for young readers, this book is perfect for people of all ages who want a fresh, youthful perspective on the life of Jesus. “Journey to the Cross” follows the light of hope that first appeared on that special night in Bethlehem, while incorporating the legend of how the donkey came to have the cross permanently embedded in his coat, known as “the Jesus donkey”.